Saratoga Mineral Springs: Reached via Northwestern Pacific R.R. to Ukiah, thence 22 miles by stagecoach. Buy round trip tickets direct to the springs. The banner spot of Lake County, on Tahoe-Ukiah highway. 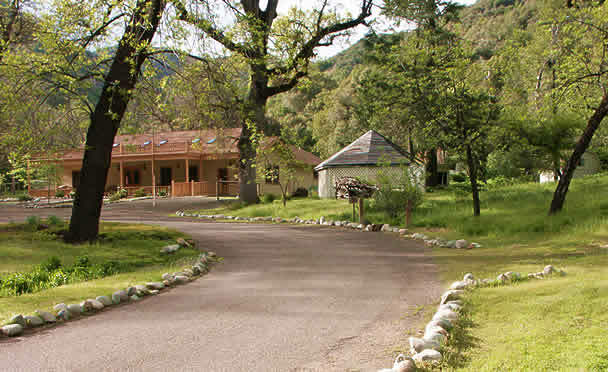 Situated in a miniature valley at 1500 feet elevation. Cool nights. The hotel and cottages front large level grounds, all shaded with oak and walnut trees. Cold and carbonated mineral springs, lease to the taste and consist of sulphur, magnesia, arsenic, soda, iron and seltzer and comprise laxative, appetizer and digester. Cool mineral concrete plunge 30'x60'; water highly carbonated and very invigorating. Hot mineral tub baths 50c. Electric lights throughout, telephone, post-office and store. Rooms in hotel, cottages or open air summer houses. Dancing, tennis, croquet, billiards and shuffle board. Mountain trails affording fine views of valleys and Clear Lake 7 miles distance. For health rest or pleasure, this is a the ideal place. Can accommodate 150. Rates $19.00 to $22.00 per week, children according to service required. House keeping cabins furnished except towels and silverware - $10.00 to $15.00 per week.